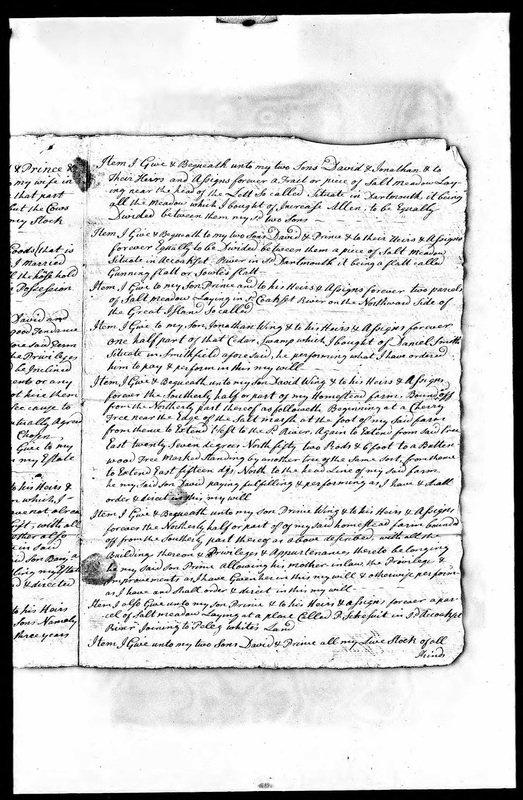 Genea-Musings: Amanuensis Monday - Post 328: Will of Benjamin Wing (1698-1782) of Dartmouth, Mass. 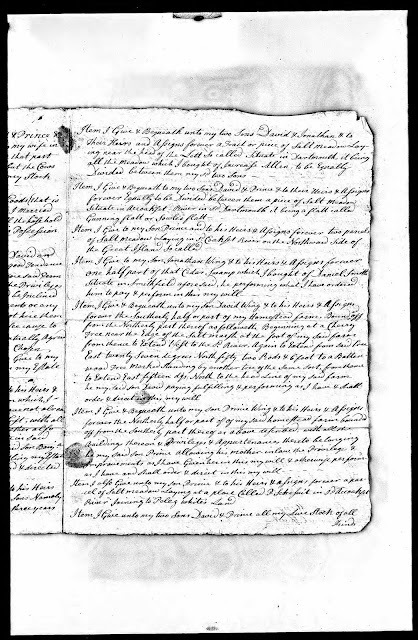 Amanuensis Monday - Post 328: Will of Benjamin Wing (1698-1782) of Dartmouth, Mass. 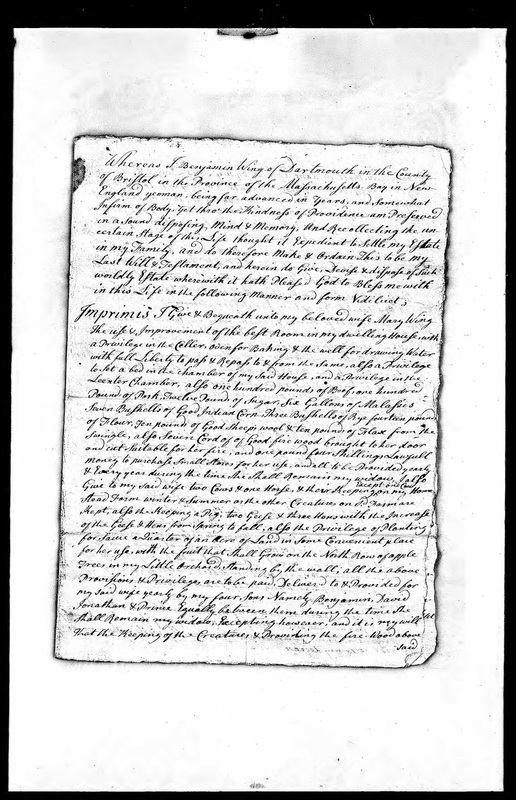 The subject today is the will of Benjamin Wing (1698-1782) of Dartmouth, Bristol county, Massachusetts. that I shall Leave at my decease. at my decease Excepting two Silver Spoons. and I desire she may Accept of them Accordingly. him to do & fulfil. Divided between them my sd two sons. Gunning Flatt or Sowle's flatt. him to pay & perform in this my will. order & direct in this my will. as I have and shall order & direct in this my will. River joining to Peleg White's Land. & Expences of Settling my Estate. with the Letters I H W also a small Brass Kettle. Item I Give to my Daughter Rhoda Tucker Sixty Shillings Lawful Money. the Sum of Ten Shillings Lawful Money. Sowle Six pence besides what I have already Given to their Mother deceased. David Jonathan & Prince Equally between them. Divided between them their Heirs & Assigns forever. Called November A.D. One Thousand Seven hundred & Seventy Six 1776. 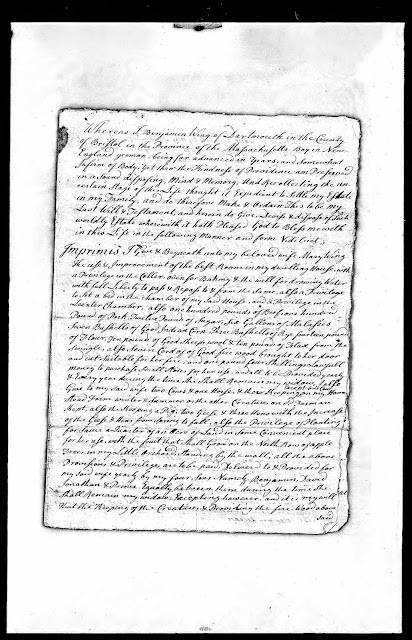 After Benjamin Wing wrote his will on 5 November 1776, he wrote a codicil on 2 April 1779.
them her said Chidren, or to the Survivors of them at my decease. they my sd sons David & Prince hath already paid & discharged. him or them Respectively so Exhibiting such account as aforesd. lings & Eight Pence per Ounce or the Equall Value thereof in Gold. herein Contained be Truly & faithfully fulfil^d & Performed. day of the fourth month A D one Thousand Seven hundred & Seventy Nine. 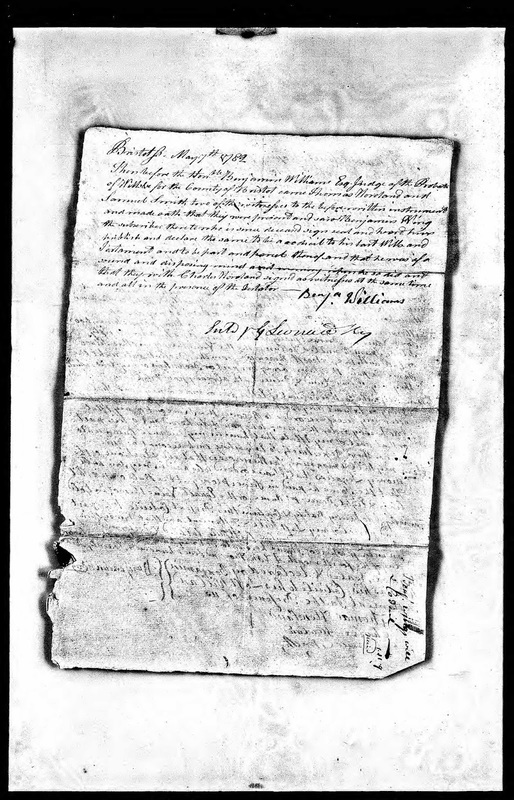 The codicil and will of Benjamin Wing was proved on 7 May 1782.
and all in the presence of the Testator. 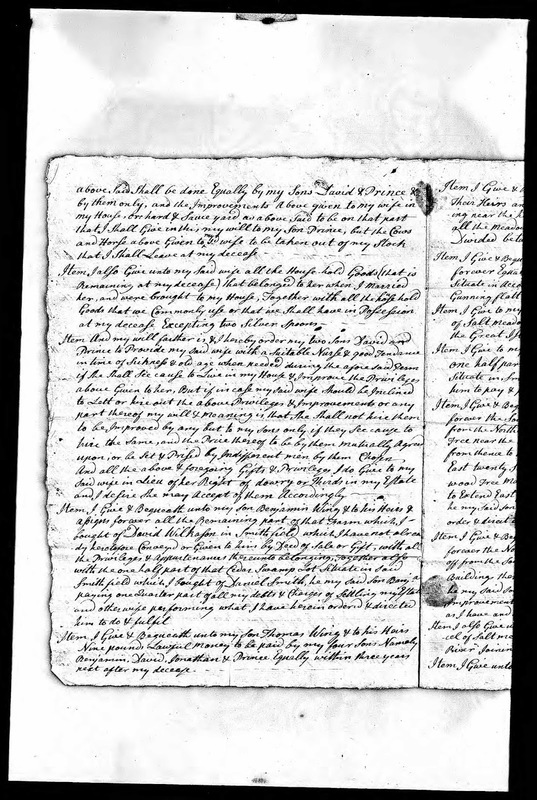 Massachusetts, Wills and Probate Records, 1635-1991, indexed database with digital images, Ancestry.com (http://www.ancestry.com), Bristol County, "Probate Records, Wilmarth, Walter - Wing, James," 7 pages (images 1214-1220 of 1488), Benjamin Wing, 1782 estate papers; original papers at Bristol County (Mass) Probate Court, Taunton, Mass. Benjamin Wing was married three times. 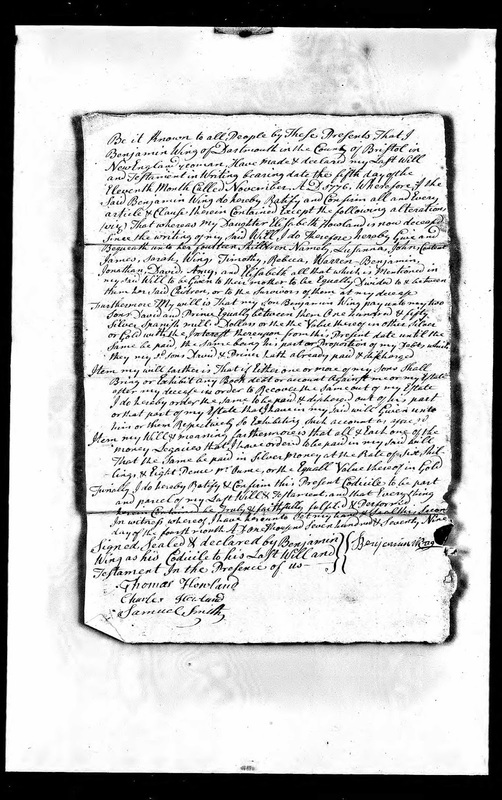 With his first wife, Content Tucker (1695-1738), he had five children - Elizabeth, Hannah, Sarah, Benjamin and Abigail Wing. 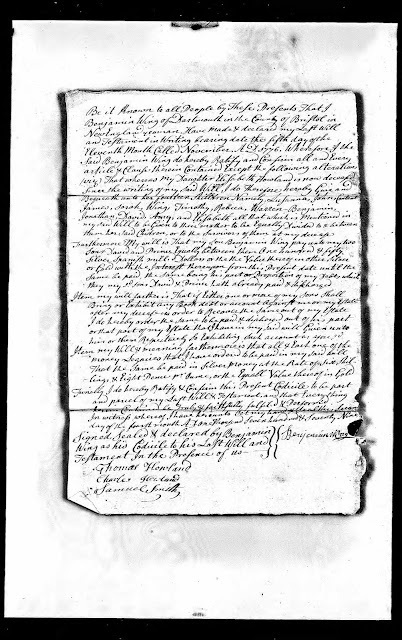 He married Rhoda Rogers (1713-1758) in 1738 and had five more children - Thomas, Rhoda, David, Jonathan and Prince Wing. 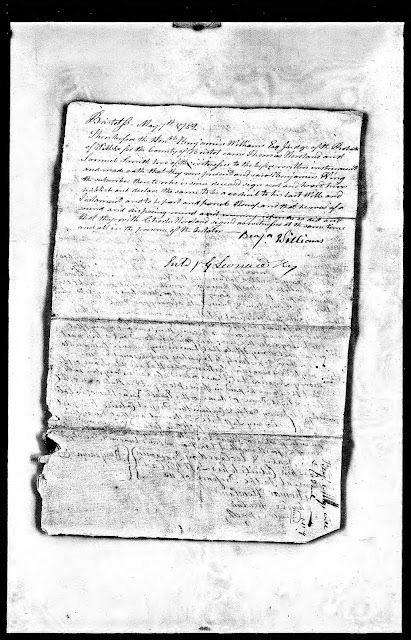 In 1764, Benjamin married, thirdly, Mary (Devol) Potter (1705-1798), who survived him; they had no children together. The will and codicil of Benjamin Wing names all ten of his children, although two daughters died before Benjamin died. 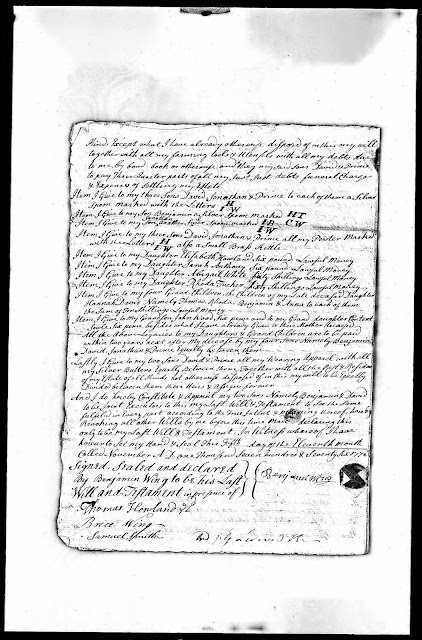 The four children of Hannah (Wing) Davis and the fourteen children of Elizabeth (Wing) Howland are named as beneficiaries in the will. Benjamin and Content (Tucker) Wing are my 6th great-grandparents. I am descended from their daughter, Abigail Wing (1734-1806), who married Jonathan White (1732-1804).